Terms & Conditions If you are moving home however big or small, we can provide a removal service to suit your needs. We are able to offer local and National deliveries alongside many other services. Terms & Conditions Are you considering moving to the continent? We have the knowledge and expertise that is required to ensure your relocation is smooth and efficient. Terms & Conditions Emigrating for business or personal reasons? Our specialist team of surveyors, packers and wrappers will set your mind at ease by their care and attention to detail. Terms & Conditions If you’re considering moving your whole office to new premises or just a small team internally, we can provide the expertise that is required to successfully manage the relocation. Terms & Conditions Need extra space at home or at the office? Moving out but don’t have a new property to move in to? We have the perfect solution with our range of storage services. Website Terms & Conditions If you are considering moving home / office or just need to place some goods in store. The process of doing this will be significantly aided by the use of good quality packing materials. Website Terms & Conditions Useful guidance before moving and further information about our services. Contact Meet the management team and find out how to locate us. 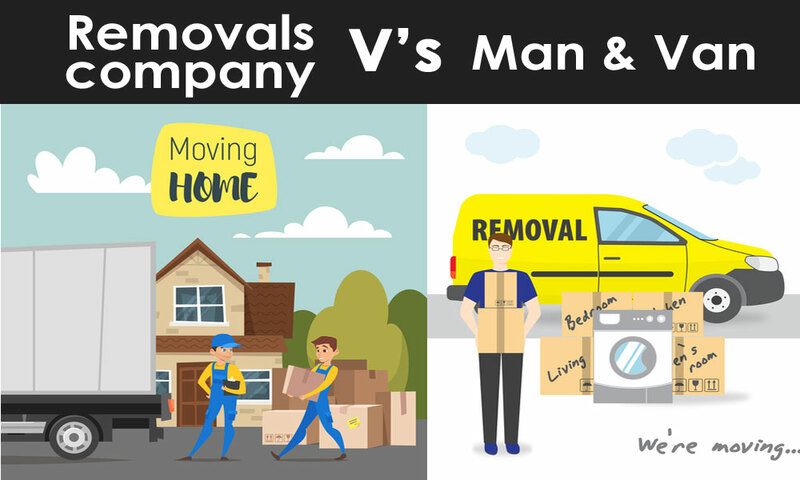 Home » News » Hiring A Van And Man Vs. A Removal Company – Which Is Best? Hiring A Van And Man Vs. A Removal Company – Which Is Best? At first glance, hiring a van and man to help you move may seem to be the least expensive option. However, there are many logistics and factors involved with moving house and choosing a professional removal company can be of far greater value in the long run. A van and man move will probably mean that you will need to do most of the heavy lifting yourself or ask for the help of friends and relatives. This puts you and others at risk of injury. Alternatively, you can employ a couple of day labourers to assist you. However, the cost of the additional labour can often make a professional move less expensive. A man and his van cannot account for the size of your move and it may mean several trips to get you relocated. A moving company on the other hand will provide a removal truck of sufficient size to move your entire household contents in one convenient trip. The man with his van will probably not be able to provide you with the skill and experience to ensure that you belongings are relocated safely, securely and without damage. Expert removals know how to move your goods (including sensitive electronics, appliances and fragile goods) to minimise the risk of damage. A little additional short term insurance can cover you in the case of loss, damage or theft of your goods while being moved. Your professional removal company will also provide all the tools, equipment and materials necessary for a safe and secure move. As mentioned above, a professional moving company can provide the convenience of a relocation in one trip. You can also rely on the convenience of knowing that your reliable removal experts will arrive on time and get you and your belongings to your destination without fuss and hassle. You can provide your removal company with a floor plan of your existing home and the layout of where you plan to place furniture and other items at your new address. This planning phase can minimize the time taken to move you as well as ensure that you have minimal adjustments to make before you are settled. Your man and van cannot provide you with the additional services that you may need for a successful move. Professional movers can provide you with storage, house cleaning, packing and unpacking services if necessary. Did you know that moving is considered to be as stressful, if not more, than going through a divorce or dealing with the death of a loved one? A professional removal company will remove all the stress associated with moving house from start to finish. Cost is almost always the deciding factor when selecting between a man and his van or a professional removal company. However, the cost should always be relative to the value that you receive. You will always receive far more value for your money when you choose expert movers over a man and his van. This entry was posted on November 23, 2018 by admin. F. Smith & Son are proud to be a member of the BAR and hold the BSEN 12522 quality standard, ensuring high standards are maintained at every stage of your removal.